Carpet prices differ considerably, and it’s worthwhile taking the time to think what type of carpet you want. There are many textures, weaves, colours and pile depths to consider, not to mention the fact that different rooms will require different carpet types. For example, a high traffic area like the stairs will need a more robust product than a study that’s only used by one person. You might be able to pick up a bargain deal under £5 per square metre, but these materials are likely to be thin, require more maintenance and will probably wear out faster. If you want a quick fix though, a cheap carpet is ideal and won’t break the bank. If possible, it’s best to opt for a mid-range carpet to ensure you actually enjoy some long-term use from it; it’ll look nicer too! The average cost will be between £15 and £20 per square metre. Finally, a premium-grade carpet with a deep plush and quality material is likely to set you back a minimum of £30 per square metre. When you’re budgeting, it’s also important to remember that underlay can be a surprising, and often forgotten, cost. In general, you should allow between £3.50 to £10 per square metre, depending on the quality of insulation you want. Wherever your budget allows, it’s a good idea to hire a professional so you’re assured of a perfect fit. Quotatis has a host of tradesman to gather quotes from, and is a great place to start looking. In general, the type of carpet you’ve bought won’t have a huge impact on the cost of fitting it. 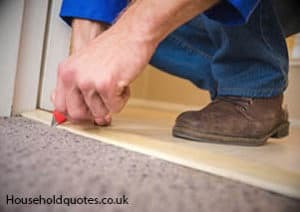 For example, the labour cost of fitting a carpet in a room that is 30m² should be in the region of £120, including any grippers and door easing that’s needed. Meanwhile, the cost of carpeting a single staircase without any turns will be around £75. These costs are unlikely to be affected by the fact you’ve bought a budget carpet or gone for a premium product instead. The cost of having a new carpet fitted can vary vastly so it’s essential to get several quotes. Regional differences are common, with labour costs higher in more affluent areas like London. Some installers will offer a lower price if you buy the carpet through them, whilst others will charge more per square metre if you’re only doing a small room. Overall, it’s best to get at least three quotes and then factor in the price of carpet, underlay and any accessories needed. You can then choose the most competitive quote – you might even discover you can spend a little more on carpet than you thought. Though you might be hiring carpet fitters, there are a number of things you can do to help lower the costs. Firstly, you should empty the rooms where the installation’s taking place. If your fitters arrive only to realise you’ve still got furniture everywhere, they won’t be amused. You’ll also have to pay at least £20 extra per room. It’s also important to pull up your old carpet – for a number of reasons. The price of carpet removal and disposal isn’t normally included in carpet fitting costs, and you can pay between £1 and £2 per square metre if fitters have to do this. In addition, you’ll probably be charged a disposal fee. Removing the old carpet also gives you the chance to inspect your floor. If, for example, a floorboard is broken, it will need replacing before the new carpet can go down. This is a relatively simply DIY project, but will cost around £15 per square metre if contractors do it. Likewise, if you have a cement floor that’s not level, new screed will be required. This can cost £10 per square metre, so it’s best to check your floor in advance. Finally, if you’ve chosen a carpet with a rather plush pile, you might need a couple of centimetres taking off the underside of doors. This can cost around £15 per door. Also make sure you’re not being charged for underlay your not getting. Most companies will sell you underlay that you don’t get. ie your room is 7m x 3m the carpet comes 4m wide, so you have to buy the carpet with that 7m x 1m waste but all companies will sell you the undelay to go under all the carpet even the waste.